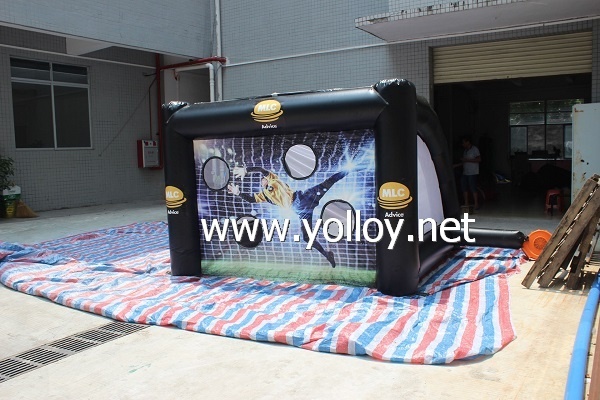 Soccer Shootout or Penalty Shootout as it is often referred to is an hire ideal choice for birthday parties, football clubs, corporate fun days and fund raising events. It is visually very impressive and a real crowd puller. Soccer Shootout is a great fun for both the penalty taker and goal keeper. Players score by getting the ball past the goal keeper and are awarded extra points if they can get it through one of the scoring holes in the net. 1,We have a very talented design team to ensure the best possible designs for you. 2,We deliver high quality on a reliable basis by applying proven quality management techniques which ensure strict standards for our skilled workforce. 3,We ensure competitive pricing every time. 4,We have a very flexible and effective production scheduling system in our factory to ensure we are able to meet your preferred delivery schedule. 5,We sincerely hope our honest and responsive service will deliver more win-win business with our customers.